But I couldn’t help but think that this movie was some sort of defining triumph for the entertainment-industrial complex. Yes, I understand how Beyonce had to overcome her childhood spent in a well-to-do neighborhood to claim her rightful place as a multi-million gazillion ultra-watt superstar. That takes a lot of hard work as well as natural talent. But she should learn to let her success take a day off once in a while. 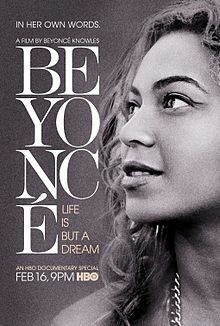 “Life is But a Dream” is stuffed to the gills with redundant and defensive declarations of self-esteem and empowerment, while the in-concert production numbers are choreographed to within an inch of their lives. The surrogate interviewer serves up cupcake questions like “When did you first realize that all you needed was yourself?” Some of her comments are more revealing than they at first appear. My antenna was full up on such observations as “I felt like I had been so commercially successful… it wasn’t enough” and “there’s something really stressful about having to keep up with it.” I guess that means if the public suddenly tired of the high-tech burlesque act she would have to return to the upper middle classes. The horror! After Beyonce pointed out a couple of people who only “kinda” liked her show, security escorted them from the arena to protect them from fans who don’t like “haters”. It all makes me feel a little like the guy in the SNL sketch who was roundly chastised by his friends because he only moderately liked Beyonce’s latest single. Although I don’t think it would jibe with her actual politics, her success is the show-biz equivalent of Republican Party worship of the 1% “job creators” with any opposition cheaply written off as “jealously” or the work of “haters.” The pop music business has been gutted of its middle class or at least it feels that way. All that’s left is the semi-required worship of designated A-listers like Beyonce because that’s the American way. Aspiring singers who want a piece of the action can enjoy toiling in obscurity or maybe getting an assumed big break on something like “American Idol” or “The Voice” and be handpicked by other celebrities sitting in judgment. Otherwise, there’s no more room at the top. (Interestingly, the unquestioning veneration of musical artists can be just as rigid on the opposite end of the pop’s socio-economic ladder. More on that in the next installment of Dubious Docs).